Earlier this week, we told you about some of the praise guitarist Kenny Wayne Shepherd had to offer concerning the great B.B. King in the liner notes of Shepherd’s new album Goin’ Home. In addition to telling us that he has “known and played with the King of the Blues since I was 15 years old” and identifying King as “one of my biggest influences”, Shepherd also observed that “No musician has better shown that sometimes you can say everything you need to say with just one note”, a sentiment echoed by a host of fellow musicians – including Bono, Eric Clapton, Mick Taylor, John Mayall, Bobby “Blue” Bland, Joe Bonamassa, Bruce Willis, Robert Cray, Derek Trucks, and Jonny Lang – at one point during the B.B. King – The Life of Riley documentary currently screening in theaters throughout the U.S. Released in 2012 in the UK, the acclaimed documentary has finally made its way to the states for a limited theatrical screening – playing just one night in many cities – before it’s issued on DVD and Blu-Ray in mid-June. Produced and directed by Jon Brewer, who worked with King for more than two years and collected hundreds of hours of footage for the project, and narrated by Morgan Freeman, B.B. 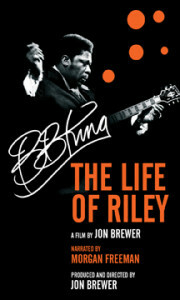 King – The Life of Riley features interviews with King and a plethora of other musicians and music industry personnel (a number of whom have since passed on), including Bobby “Blue” Bland, Bonnie Raitt, Walter Trout, Carlos Santana, Bono, Joe Bonamassa, Bruce Willis, Aaron Neville, Eric Clapton, Leon Russell, Rufus Thomas, Robert Lockwood Jr., Buddy Guy, B.B.’s longtime trumpet player and bandleader Calvin Owens, photographer Ernest Withers, Dr. John, John Mayer, Jonny Lang, Robert Cray, Billy Boy Arnold, Kenny Wayne Shepherd, Ronnie Wood, Mick Taylor, Paul Rodgers, Peter Green, Johnny Winter, Derek Trucks, John Mayall, Joe Walsh, Solomon Burke, Ringo Starr, Bill Wyman, Keith Richards, Susan Tedeschi, and King’s longtime manager Sid Siedenberg, as well as several other managers and producers who have worked with King through the years. In addition to plenty of both early and more recent footage of King, the movie takes fans riding with the King of the Blues to visit King’s birthplace and some of the plantations and cotton fields King once worked, also recounting King’s family, his early days in Memphis – where he earned the nickname of “Blues Boy”, later shortened to B.B. – and the story behind the naming of his guitar Lucille, as well as musical collaborations with the likes of Leon Russell (“Hummingbird”), Bono (“When Love Comes to Town”), and Eric Clapton (Riding with the King). Clocking in at an hour and a half, the film offers a nice look back at the life and career of one of blues music’s finest and serves as a powerful reminder of all that King has brought to the genre as well as the countless other musicians he has influenced and inspired. The documentary also of course includes a pretty great musical sequence, much of which is available on the companion soundtrack, including two songs previously unavailable digitally in “Walking Dr. Bill” and a “Sweet Sixteen” from a 1974 show in Africa. You can catch the film in theaters only through the end of May. Whether you see it on the big screen or wait for it on DVD or Blu-Ray, B.B. King – The Life of Riley is one everyone should watch! This entry was posted in Movies and tagged B.B. King. Bookmark the permalink.